Did you know that over 30 brand new stylus pens came out in 2014 alone? We've had to make some serious adjustments to our site to properly feature these new promo pens. We have stylus pens to fit every budget, and each pen has its own distinct look and feel, as well as offering different mechanisms, ink types, colors, and more. To the left you can see one of our fancier stylus pens. 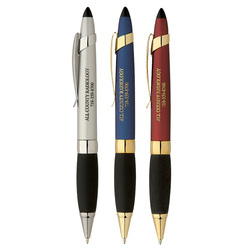 These are twist mechanism brass ballpoint pens with your logo engraved on the side. You also have the option of imprinting these in one color, but with nice brass pens like these, it is much more common to engrave them. Engraving looks classy, and these pens write very nicely with the standard black ballpoint ink that is included. Shifting gears WAY in the opposite direction is another stylus pen that is new for 2014. Just a few years ago, when stylus pens came out, it was unheard of for there to be a capacitive stylus pen offered in this price category. Don't let the fact that these writing instruments are plastic fool you as to their inherent quality. The writing ability is top notch for the price category, and the curvaceous design will really turn heads. 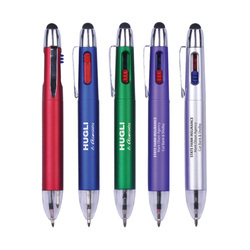 These pens are under $0.60 each with your one color logo. We also have the ability to print the clip for an additional fee. If you have a big event coming up, or work in a place where you give out a lot of customized pens, this is one click stylus pen that you should definitely look into. Just a few short years ago, you used to have a handful of stylus pen choices. Some were plastic, some were metal, and if you were lucky, you'd have a choice of ink color and click mechanism. That was it, back when we were kids. We also had to walk to school in 4 ft. of snow, not like today where the school bus stops at every corner. Kids today have it easy. Lucky for us, we now have it easy when it comes to awesome stylus personalized pen choices. When the first batch of these came out, I was wondering when they would start offering combination or multi function stylus pens, and finally they did. 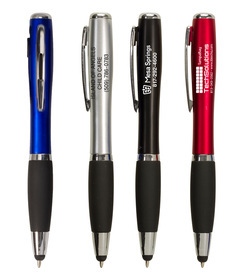 This pen, seen to the left, has a comfortable grip and a bright white flashlight, as well as your company logo. Call 401-451-1874 and order some, they are WAY under $2 per pc., and look fantastic. What's that movie where the cars become robots to fight evil, and there are loud noises and explosions? Well, whatever that movie is, has nothing on these fantastic pens that start off as a pen and then transform into a stylus when you activate it using the twist mechanism. 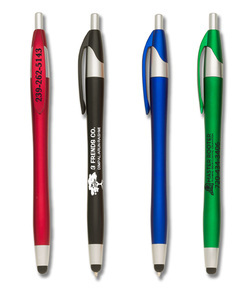 Did we mention that these have a comfortable grip and arrive imprinted with your corporate logo? Well...they do. This is another metal pen that we can either engrave or print, and this jack of two trades looks great with either imprint method. One of our favorite types of pen is the multi color ink pen. They also happen to be very popular in the healthcare industry, specifically with nurses, because they have actual business reasons for writing in multiple colors. Even for normal civilian business owners, it is useful to have more than one color ink at your disposal, and even more useful for your stylus to be attached to your multi color ink pen. Add to that that these pens are very funky looking and don't cost much, and you have a real winner, whether you are using these pens for promotions or just around the office. 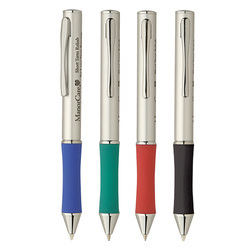 These snazzy pens come with your one color logo, and you can write with these in black or red. Whatever you do, don't press both color buttons at once, we know you're a rascal!